Add all ingredients to a blender. Blend until smooth and pour into a white wine or martini glass. Garnish with a mint sprig or edible flower. *See our Mango Purée recipe/video or use store-bought purée. **Unless your fresh mangos are very sweet, add ½ oz. simple syrup. 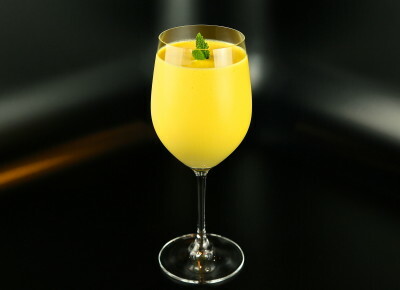 Batidas are a class of fun, sweet, and fruity blended cocktails from Brazil, which typically utilize their national spirit: Cachaça. They are super-sweet and a sugar-bomb – which may explain why Brazilians stay up half the night dancing! 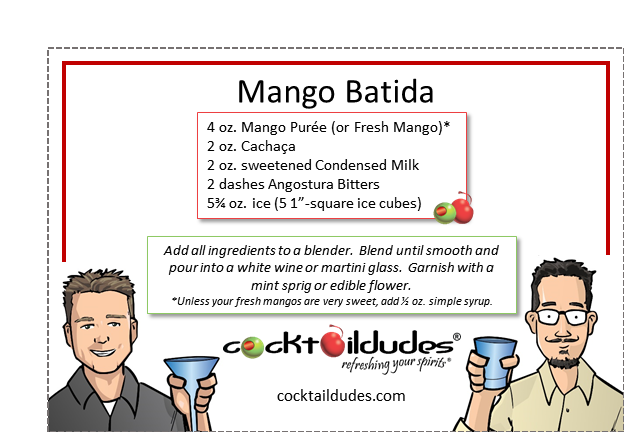 We’re using mango for this batida, but you can use this same recipe and substitute most any other fruit. We add Angostura bitters which give a nice cinnamon spice and more depth to the cocktail. Check out the other Batidas we’ve made, including some of our crazy takes on this refreshing drink from Brazil. Cheers!